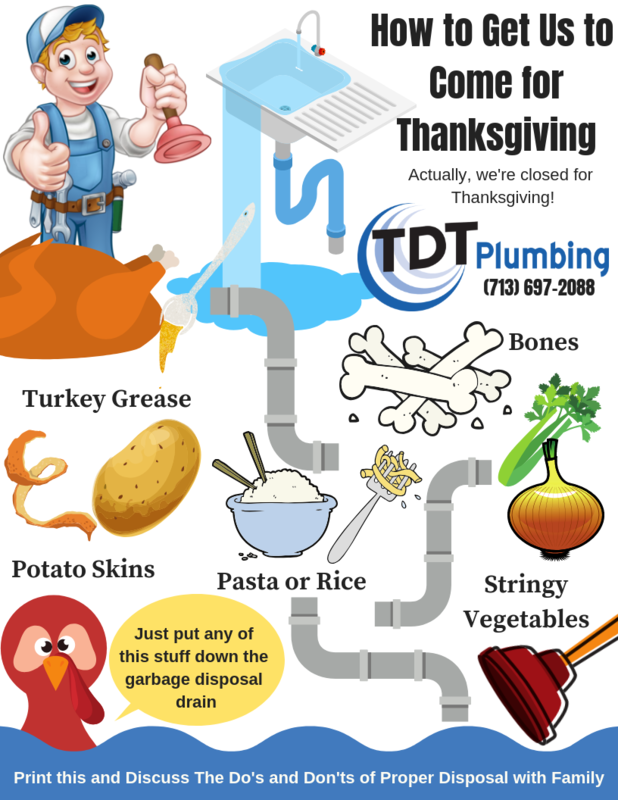 No one is thankful for a clogged disposal or drain. Clogged disposal or sink drain on Thanksgiving is nothing more than a headache. What you put down your disposal matters. Here’s the scoop for those homeowners who want to keep drains clear during the holidays. Pipes will appreciate the thoughtfulness on Thanksgiving, and so will your spouse! Turkey fat drippings: When making gravy, your recipe will inevitably call for turkey fat or drippings. Turkey drippings are fat and oil. These substances are horrible for your plumbing. While turkey oil is liquid when hot, it hardens like cement when it chills resulting in a clog just like too much fat in your coronary arteries! Eventually, the drain will plug up. Use a glass mason jar or large aluminum can (once drippings have cooled considerably). We found a way to do it the proper way on lifehacker.com. Potato skins: Potato skins are not your sink’s friend, although, baked with butter, cheese and some sour cream, they are quite delightful! Dumping large quantities of them down the drain will wreak havoc. The starch in the skins, when mixed with water, becomes glue binding them with everything else that gets washed down the drain. If you peel them over the sink – peel into a strainer or colander and empty the peels into the trash or compost them. Turkey bones: While you may think a couple of odds and ends going down the disposal will be safe, turkey bones can devastate your garbage disposal. Unless you want to see us on Thanksgiving Day, keep the bones out of the sink! Celery, onions, and eggshells: Just like with your washing machine or vacuum cleaner, things can wrap around the spinning mechanism in your disposal and stop it in its tracks. A garbage disposal is no place for your hands to explore why the blade won’t spin. Avoid stringy fruits and vegetables going into the drain and keep things moving! Keep your hands out of the garbage disposal! Pasta and rice: Pasta is one of the greatest guilty parties with regards to pipe clogs. Whenever pasta and rice are placed in water, they absorb the water and expand. Once down the drain, pasta and rice swell up making a paste-like substance. Again, you’re introducing a kind of “glue” into your sink that will bind your drain’s contents. It’s not hard to guess what happens next. Use a strainer or colander to filter pasta and rice from the sink and transfer the excess to the trash can or compost. More than likely, you will have helpers in the kitchen during holiday cooking. We have done you a great favor and have created a “what not to dispose of down the drain” printout you can place next to the sink so guests know what is and isn’t safe to put in the drain, even when there is a garbage disposal. If nothing else, it will be a conversation starter with Aunt Mildred. If your sink or other fixtures are already draining slowly, it might be a good idea to have us come out and do some pre-holiday maintenance. The last thing anyone wants is to have a stopped up sink and a pile of dishes and a toilet that won’t flush. Have peace of mind and give us a call! We’re ready to help unclog your clogged drain. We’d, of course, be flattered with an invite to Thanksgiving dinner with your family, but let’s make it about making memories and not about clogged drains! You can reach us during business hours at (713) 697-2088.